Looking for a MERCURY MYSTIQUE keyless entry remotes for your car? We offer key fobs for all Mercury Mystique for your convenience. Mercury Mystique remote controls now available with savings up to 75% off dealer price. FREE Mystique remote programming instructions included with the purchase. 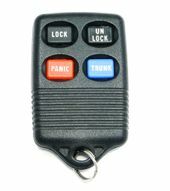 Order replacement Mystique key fobs from us and save big. Mystique chip keys, remote covers and remote transmitters always sale.